Being worried about suffering from motion sickness during a flight can raise levels of anxiety in many people for those who are already scared of flying, anxiety can reach very high levels and a phobia can develop. True motion sickness occurs when the brain becomes confused by the messages it is receiving. The eye will be sending one message and the delicate structures of the ear will be interpreting the environment differently and sending a contradictory message. Small changes in movement of the surrounding environment can cause the eye to see a stable image, but the inner ear to feel the changes as quite dramatic. Some people are affected by certain smells and sounds, particularly those of an airport that can include fuel, crowds, queuing, fast food and the general smell of an airport. This can trigger nausea, which when combined with a strong fear of flying, can be unpleasant and distressing for the sufferer. Some people will be so afraid of having air sickness, perhaps because of a previous experience, that this fear will dominate thoughts leading up to the flight triggering the development of high levels of anxiety or even a panic attack, exacerbating the general symptoms of aerophobia. If a person has experienced air sickness on a previous flight, they may become anxious and dread the flight a long time before they check-in at the airport. This will cause the general symptoms of anxiety such as feelings of nervousness, nausea, diarrhoea, sweating and shaking. If the person does actually experience air sickness, they may only encounter the feelings of nausea, which can be very unpleasant as they can last for the duration of the flight; feeling uneasy can cause sweating or an increase in perspiration, shaking and a minor loss of balance. Sickness can occur and though this may temporarily relieve the feelings of nausea, they can return and cause further episodes of sickness. Prolonged occurrences of sickness can cause the person to become dehydrated, a risk of flying in itself, leading to further nausea. As there is less movement around the wing of the aircraft and it is more stable, it is recommended that those who are scared of suffering from air sickness should try and pre-book a seat in this area, or mention to the airline staff when checking-in and requesting a seat here if possible. The use of a portable music device will serve as a distraction and give the person something to concentrate on instead of their nausea. Reading is not recommended as this can exacerbate the motion imbalances. Close eyes and use the headrest when able, this stabilises the head and removes messages sent from the eye to the brain.Avoid large meals and alcohol before and during the flight and frequently sip water throughout the flight. Ginger biscuits or mint sweets have proven beneficial to many sufferers of motion sickness; the sweets will also help to avoid ear problems associated with flying. The use of anti-sickness remedies or prescriptions may be required, speak to a pharmacist or GP for a recommendation.Take baby wipes or moisturising wipes to help keep refreshed and to maintain hygiene needs. 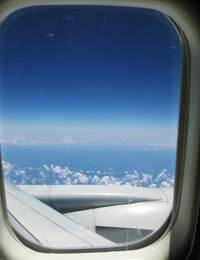 Motion sickness can be treated and minimised but can contribute to the reason why someone may be scared of flying.